With the authorities in the Siberian city of Barnaul refusing to permit opposition protests since December 10, activists have deployed a creative tactic to voice their opposition to the recent disputed parliamentary elections. 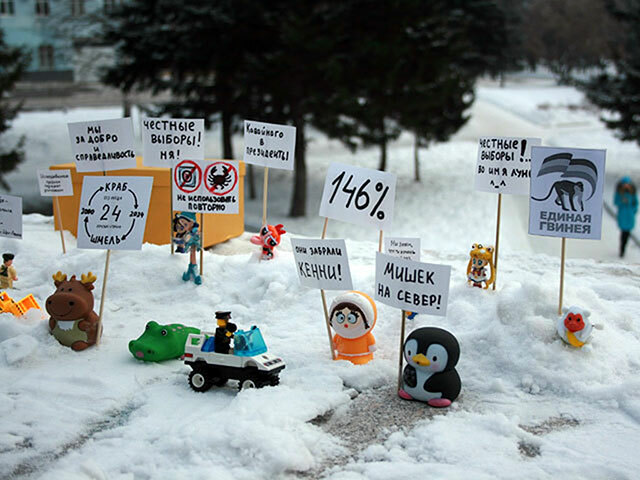 dozens of small dolls – teddy bears, Lego men, South Park figurines – arranged to mimic a protest, complete with signs reading: “I’m for clean elections” and “A thief should sit in jail, not in the Kremlin”. They tried to tell us our event was illegal – they even said that to put toys in the snow, we had to rent it from the city authorities. It is this kind of overreaction that organizers should hope for. By revealing so clearly the absurdity of the state’s attempt to crackdown on dissent, while getting a laugh in process, actions like these will likely only galvanize the opposition. To see more photos of the display, click here.